The Ricks Bead­ing Loom comes fully assem­bled with three warp rods (one is a spare), four warp pegs (one is a spare), a warp sep­a­ra­tor card and easy-to-follow step-by-step instruc­tions fully illus­trated in color to get you started. Sturdy hard­wood con­struc­tion for a life­time of bead­ing. The ergonomic design lets you to bead at a com­fort­able, nat­ural angle and lessens strain on your wrists. Fully adjustable from two to twelve inches in length — this allows you to make a vari­ety of projects of nearly any size. A per­fect fin­ish every time! You’re left with only TWO WARP THREADS to weave back in after you com­plete your project. The same project woven on an ordi­nary loom (left) leaves you with lots of messy warp threads to weave back in. With The Ricks Bead­ing Loom, you never have more than two warp threads left to deal with (as seen on the right). 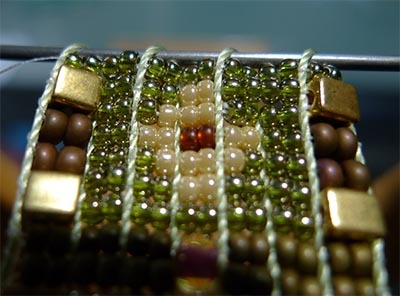 You can use any size or shape bead with­out any adap­ters – even mix bead sizes and types in the same project. 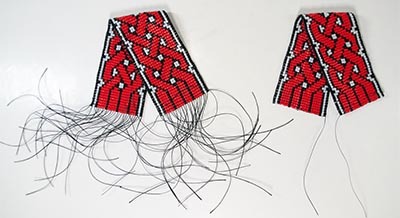 Cre­ate jew­el­ery and wear­able art impos­si­ble to make on other looms. You can loom with Japan­ese cylin­der beads, seed beads of any size (and mix sizes if you wish). You can loom with two-hole flat beads, bi-cone or fire pol­ished crys­tals. All with­out mak­ing any changes or installing any adap­tors on your loom. You’re finally free to cre­ate, to do what the artist inside of you dictates.